Players in Europe are set to step out of the polymer markets for Christmas and New Year holidays as per ChemOrbis. 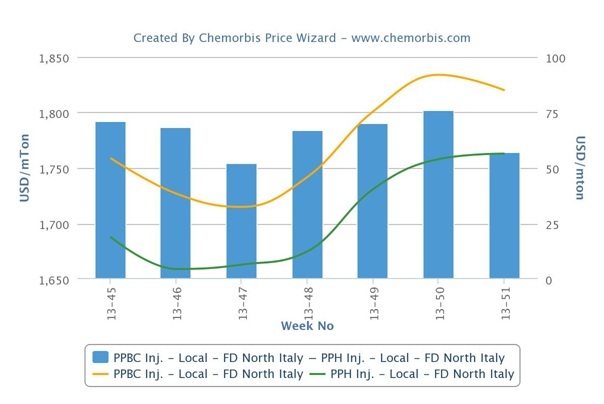 In Italy, PP and PE suppliers wrapped up their monthly business with increases of up to €60/ton on their December deals supported by limited supplies on some sellers’ side. Meanwhile, January expectations already surfaced with renewed hikes amidst firm expectations for new monomer contracts in the region. 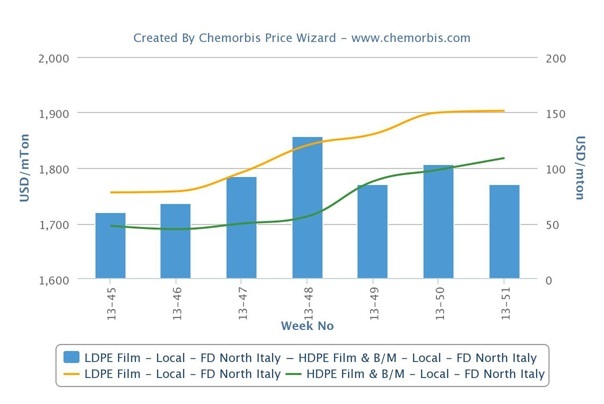 January propylene contracts may settle €20-30/ton higher month over month, players in Italy think, which would support new hike attempts in the downstream PP market. A couple of suppliers in nearby Turkey also voiced their expectations of seeing increases of similar amounts on new European monomer settlements. A converter reported paying €50/ton hikes for West European homo PP and PP block copolymer injection cargos, saying, “Although we were looking for some extra volumes, our suppliers were not able to offer material citing their limited availability. We heard about possible further price hikes for January.” A container maker also said that he finalized his December transactions with increases in line with the propylene contracts, while they also purchased some spot PP copolymer volumes amidst their worries regarding the January outlook. On the other hand, some players do not foresee drastic increases for next month considering stable spot monomer costs from early December and many feel the current prices are already too high. A buyer paid €50-60/ton increases over November for several West European origins. “We are concerned about a new series of increases for next month whereas sellers may not obtain large hikes as prices are already high considering this time of the year,” the buyer mentioned, adding that he was not able to meet his LLDPE needs as his regular suppliers didn’t have enough allocation. The firm trend in the PE market is seen extending into January too with players expecting increases between €30-60/ton. A West European producer already expressed, “We expect to see some increases on the new ethylene settlements while we plan to seek some premium over the ethylene rise.” A packaging converter reported that they were offered Middle Eastern LDPE that will be delivered in January with €20-30/ton increases from last week. According to ChemOrbis, a distributor said he closed his December business amidst his tight supplies especially for LDPE while he heard market talk about higher announcements for next month. “Our LDPE and HDPE film availability is tight. We anticipate some increases next month although we are not sure if they would be fully achieved if demand remains sluggish similar to the latter part of December,” another distributor noted.